North Korea has reacted angrily to a UN resolution condemning its recent rocket launch, pledging to strengthen military and nuclear capabilities. The Security Council unanimously passed the resolution, which also expanded existing sanctions, on Tuesday. North Korea, in a statement early on Wednesday, pledged to bolster its "nuclear deterrent" and ruled out denuclearisation talks. The resolution followed Pyongyang's successful December launch. 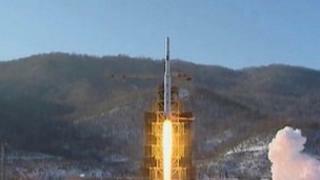 North Korea said the three-stage rocket put a communications satellite into space. But its neighbours and the US said the move constituted a test of long-range missile technology banned under UN resolutions passed after Pyongyang's nuclear tests in 2006 and 2009. The Security Council resolution was proposed by the US and backed by China, North Korea's closest ally and biggest trading partner. It represented a compromise between the two nations, with the US pushing for new sanctions and China for a statement, rather than a resolution. Chinese support was a blow for Pyongyang, observers say. Under the resolution - which pledged "significant action" if North Korea carried out a third nuclear test - North Korea's space agency, a bank and a number of trading companies and individuals were added to existing sanctions lists. "This resolution demonstrates to North Korea that there are unanimous and significant consequences for its flagrant violation" of previous resolutions, said US Ambassador to the UN Susan Rice. Both South Korea and Japan welcomed the resolution, with Japanese Prime Minister Shinzo Abe calling it a "resolute action". Chinese envoy to the UN Li Baodong, meanwhile, said Beijing believed "that action taken by the council should be prudent, measured, proportionate and conducive to stability". North Korea responded swiftly, with a statement from its foreign minister carried by state news agency KCNA condemning the "extremely unfair" resolution as a violation of sovereign rights. "We will take physical actions aimed at expanding and strengthening our self-defensive military forces, including nuclear deterrence," it said. It also stated that there would be "no dialogue to discuss denuclearisation of the Korean peninsula", in an apparent reference to long-stalled six-nation talks aimed at ending Pyongyang's nuclear ambitions. In recent weeks reports from both the US and South Korea have described activity at North Korea's nuclear test sites, sparking concerns North Korea could be preparing for a third test. Pyongyang has conducted two nuclear tests, the first in 2006 and the second in 2009. The US and North Korea's neighbours fear Pyongyang's ultimate goal is to put a nuclear warhead on a long-range missile that could target the west coast of the US, but it is not believed to have mastered the technology yet.